Beijing upset Shanghai in the opener. Beijing Ducks shot 60.6 percent from the field. Beijing Ducks outrebounded Sharks 40-28 including a 31-19 advantage in defensive rebounds. They shot the lights out from three sinking 14 long-distance shots on high 58.3 percentage. Beijing Ducks looked well-organized offensively handing out 23 assists. American guard Aaron Jackson (190-86, college: Duquesne) fired 29 points, 9 rebounds and 6 assists for the winners. Croatian-American center Justin Hamilton (213-90, college: LSU) chipped in a double-double by scoring 31 points, 10 rebounds and 4 blocks (on 13-of-17 shooting from the field). International guard Xudong Luo (188-88) produced 24 points and American point guard Jimmer Fredette (188-89, college: BYU) added 20 points and 5 steals respectively for lost side. Four Beijing Ducks and five Sharks players scored in double figures. Both coaches used bench players which allowed the starters a little rest for the next games. Zhejiang rallied past Guangsha for 1-0 lead. Golden Bulls made 23-of-30 charity shots (76.7 percent) during the game. They brought some defensive toughness making 7 blocks. Zhejiang Guangsha Lions were plagued by 30 personal fouls down the stretch. American guard Marcus Denmon (191-90, college: Missouri, agency: BeoBasket) nailed 32 points, 9 rebounds and 6 assists for the winning side and his fellow American import guard Brandon Paul (193-91, college: Illinois, agency: Pensack Sports) accounted for 27 points, 7 rebounds and 5 assists. International center Jinqiu Hu (208-97) came up with a double-double by scoring 22 points and 15 rebounds and American point guard Courtney Fortson (180-88, college: Arkansas) added 23 points and 7 assists respectively for Zhejiang Guangsha Lions in the defeat. Both teams had five players each who scored in double figures. Fujian outscored Jilian in the first game of the series. Sturgeons outrebounded Jilin Tigers 44-33 including a 35-23 advantage in defensive rebounds. 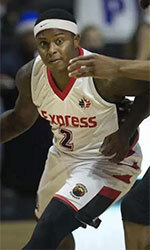 Canadian Andrew Nicholson (206-89, college: St.Bonaventure) fired 29 points, 9 rebounds and 4 assists for the winners. 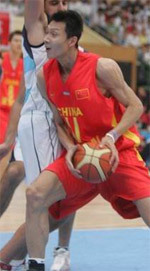 International Zhelin Wang (214-94) chipped in a double-double by scoring 21 points and 15 rebounds. Five Sturgeons players scored in double figures. Sturgeons' coach ShiLong Zhu used a ten-player rotation and allowed the starting five to rest. Polish-Swedish power forward Maciej Lampe (211-85) produced a double-double by scoring 43 points (!!!) and 13 rebounds and American guard Dominique Jones (193-88, college: S.Florida) added 26 points, 5 rebounds and 5 assists respectively for lost side. Jiangsu prevailed against Shandong to surge ahead in the series. Jiangsu Dragons dominated down low during the game scoring 60 of its points in the paint compared to Golden Stars' 38. They looked well-organized offensively handing out 26 assists. Great defensive blocking was one of the keys in this match when Jiangsu Dragons made 10 blocks. 25 personal fouls committed by Golden Stars helped opponents get some easy free throw opportunities. Serbian center Miroslav Raduljica (213-88) stepped up with a double-double by scoring 30 points, 13 rebounds and 5 assists for the winners and center Quanxi Wu (210-94) chipped in 16 points, 15 rebounds and 7 blocks. At the losing side American point guard Ty Lawson (180-87, college: N.Carolina) responded with 22 points, 5 rebounds and 8 assists and Lithuanian power forward Donatas Motiejunas (213-90) scored 17 points and 9 rebounds. Four Jiangsu Dragons and five Golden Stars players scored in double figures.